Sometimes we all crave a bit of a fresh new look in our homes. I know I'm always craving a bit of new here and a bit of new there. But it doesn't have to be an entire makeover of the lounge room or bedroom or dining room. It can just be a very simple addition like this little old cane table and blue and white planter pot and books which one of our very special Black & Spiro customers put together in her home last week. She popped into B&S last Saturday and picked up the table and put a few of her other B&S purchases on top with some fresh orchids in the pot. What a breath of fresh air and so easily, quickly and inexpensively thrown together!! I'm the same way. These pieces pair perfectly. That's a really pretty vignette! 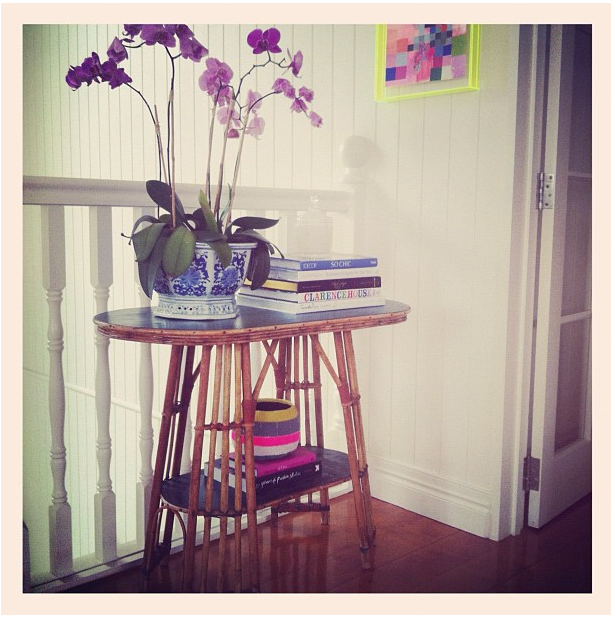 I can hardly get enough of vintage cane furniture-I love that little table! I know what you mean. I love to tinker around and sometimes just changing the arrangement of things in particular nooks, shifting a chair, or re-doing a display makes you see everything with fresh eyes and you start to appreciate it all over again. Simple additions to our life are sometimes the best and most meaningful. ... and I love the Lucite framed art on the wall. Simple and gorgeous!Love the pop of neon. Lovely! What a wonderful table...it would look so perfect in so many places. The flower pot in the picture is very portuguese! Yeap the simplest ideas are usually some of the best and the great value. Lovely little table your customer picked up. Beautiful vintage cane in good condition is so hard to find in Brisbane. It just looks perfect in that location. Lovely. And so nice to see how something relatively inexpensive can brighten up an underutilized space. Your shop looks amazing. I wish I could visit--maybe someday. It would be an expensive plane ticket just to go shopping. Love the beautiful images you post on your blog.